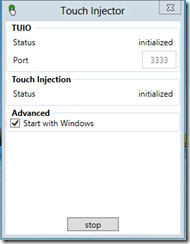 TouchInjector is a Windows 8 Desktop application that translates TUIO into Windows Touch messages. It’s lightweight, easy to use and does not get in the way. No installation is required and with one click you can customize it to autorun with the system (on logon). 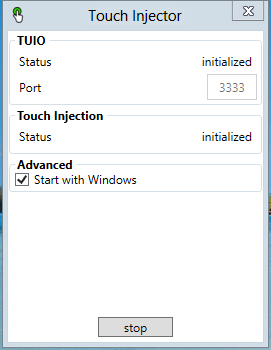 As I frequently change my display settings, TouchInjector observes them and reacts accordingly.